Captain Kevin Naismith with his children Halsey, Arina, and Adam. Canada Company, an organization that provides outreach between Canada’s Armed Forces (CAF) members and the corporate world, announced June 24 an enhancement of their Scholarship Fund at their annual scholarship awards ceremony in Toronto. The scholarship fund exists to provide financial assistance towards the post-secondary education of eligible children of Canadian soldiers who have been killed while serving in domestic or international operations of the Canadian Armed Forces and Reserves any time since Jan. 1, 2002. For the purpose of this Scholarship Fund, “killed while serving” shall include Canadian soldiers, who, while still serving in the military and having served in an active role in a domestic or international operation of the Canadian Armed Forces and Reserves any time since 2002, or who took their own lives where the suicides have been determined by a Board of Inquiry to be death by suicide attributable through military service. Eligible candidates who enroll or continue their enrolment in full-time post-secondary academic studies may be awarded annual scholarships of up to $4,000 per academic year and may be available for a maximum of four years. An initial contribution of $100,000 from the Canada Company Board of Directors to the fund has since been matched by TD, Scotiabank, RBC and BMO. This spurred an additional $10,000 donation from The Globe & Mail bringing the total additional funding to $510,000. “It is important to Canada Company that we support the men and women in uniform, and their families,” says Angela Mondou, President of Canada Company. Belinda Naismith and her family are one of over a hundred families who have been supported by the fund. Her eldest son Adam was one of the first recipients of the scholarship fund when it was founded in 2008. Adam was able to earn a Bachelor of Fine Arts (Honours) at the University of Saskatchewan with the scholarship’s aid, as well as a teaching degree, and now works as a substitute teacher. Her two younger daughters, Arina, 22, and Halsey, 19, both received scholarships to study at Saskatchewan Polytechnic. 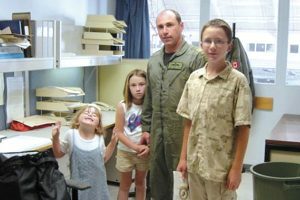 Her husband, Captain Kevin Naismith, once a fighter pilot with Squadron 416 in Cold Lake, Alberta, passed away when he was forced to eject from his fighter plane during a catastrophic flight control failure while training. To date, the Canada Company Scholarship Fund has awarded 105 scholarships since its inception. For more information, please visit www.canadacompany.ca.